If you pre-ordered a copy of NBA 2K15, you should have received a 'Locker Code' to unlock in-game content. The purpose of this tutorial is to help walk you through redeeming your Locker Code and download the Kevin Durant MVP Bonus Pack. Of course, you'll need to have a full copy of NBA 2K15 installed on your console or PC in order to redeem these Locker Codes, meaning you won't be able to cash it in before you get a copy of the game. Note: Make sure to include the dashes (-) and that there are no spaces. If it doesn't work, try to type the codes in lowercase. Connect your PS4 to an active internet connection and sign in to your account. Insert your NBA 2K15 game disc and launch the game. From the main menu, select Features/Options. Enter the Locker Code that you received, using the virtual keyboard. 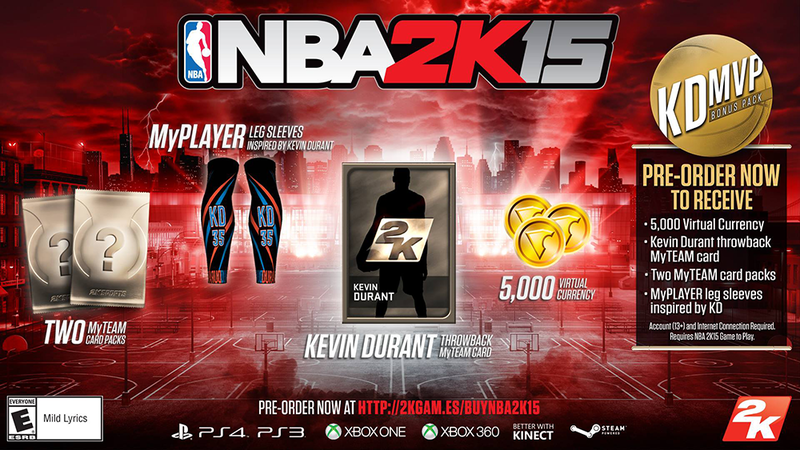 Your MyTEAM card will download automatically, along with the rest of the contents of the Kevin Durant MVP Bonus Pack. Connect your PS3 to an active internet connection and sign in to your account. Start Steam and sign into your Steam account. Launch NBA 2K15 from your Game Library. Enter the Locker Code that you received. After following the steps above you should receive your Kevin Durant MVP Bonus Pack, which includes 5,000 VC, KD leg and arm sleeves, KD throwback MyTEAM rookie card, and 2 MyTEAM card packs.